I felt that I was moving forward and toward something with all of the hours I spent learning how to draw and paint because it now had monetary value. Since he was a teenager, Timothy Rodriguez knew he wanted to do digital art. The artist grew up in La Rochelle, France and later moved to Paris where he attended École de communication visuelle – a private design school – before dropping out after one year and starting freelance in the city. 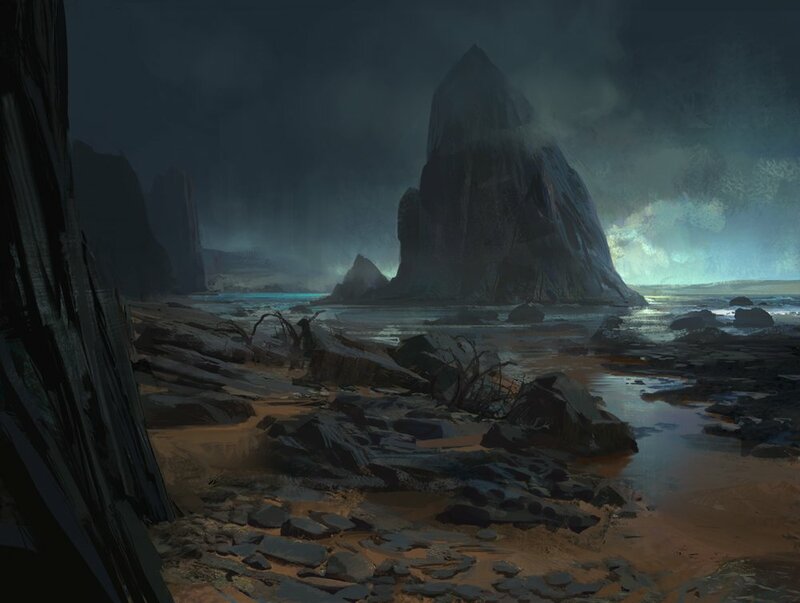 He is now an artist with years’ of experience who has worked for several renowned companies like Applibot, Bethesda Softworks and Warner Bros. Rodriguez also had the opportunity to work on popular franchises like The Elder Scrolls among others. Of course, he also works on some great personal art and he will share with us today why this is important for any artist who hopes to be successful. Tell us a little bit about yourself. What sparked your interest in digital art? Were you formally trained or self-taught? I am a twenty-five year old Concept Artist and Illustrator working in the entertainment industry. I was born and raised in France and I am currently living in Paris. I mostly do freelance work for companies like Applibot, Bethesda Softworks and Warner Bros. I have also been teaching art classes at a Parisian school called New3dge for three years now. I discovered digital art in my teens. I was playing a whole lot of video games and I was on a forum that had a whole section for graphic design. It was mostly people who were working with photo-manipulation but there were a few who were creating beautiful works using the brush tool in Photoshop. I was mind-blown. That was when I first realized that this is what I want to do so I purchased a Wacom tablet right after and spent my spare time trying to get better at it. This was nine years ago, and I am still doing my best to better myself now. All in all, I guess you could say that I am self-taught even if I went to a visual communications school for a little while. I was wanting to have a proper education in that field. However, it was all about graphic design and there were no schools that taught digital art at the time. I decided to quit and went job searching in Paris. What are some of the more exciting projects you have worked on? Are there any notable clients or studios you’ve worked with? I think that one of the more exciting projects was for Bethesda Softworks via Nuare Studio. I did a few illustrations for their upcoming collectible card video game, The Elder Scrolls: Legends. It was great and they were happy with my work. Recently, I’ve had the pleasure of working with Khang Le on his upcoming project. I can’t really tell you anything about it as of yet but working with him is a real blast! He taught me a lot of things and I was honored to work with someone who has so much talent. The other notable studios I’ve worked with include Warner Bros. but I gotta say, working for big companies like this is not always pleasant. You’ve worked on a bunch of different stuff now. What projects are you wanting to do in the future? I have a personal goal – I want to do illustrations for Magic: The Gathering, that would be such a big achievement for me. I would play that game all the time when I was a kid, and the artworks on some of those cards always fascinated me. I am using way more 3-D in my works lately and I am trying to tailor my portfolio to the film industry. I also want to make tutorials for Gumroad that will go over my 3-D process after I have done a few experiments with it. I would want to work in-house on a film. Working together with a team that shares knowledge, I’d love that! How did you feel when you did your first paid work and what should every aspiring artist expect from his first gig? I was really proud. I finally had an income of my own and it was from what initially started as a hobby – a simple way to pass the time – that was quickly growing to become something very real. There were actually people who trusted me so much that they would give me money in exchange for my services. It was a good feeling and I felt that I was moving forward and toward something with all of the hours I spent learning how to draw and paint because it now had monetary value. You gain a lot of confidence thanks to this. I still get excited whenever I get a job offer from a big company like the ones I am doing work for now, but it can be pretty scary too. On the other hand, they trust me and they gave me this job and I trust that they know what they’re doing so that usually reassures me. All’s I can do is create the best artworks I possibly can whilst also meeting the deadlines. I wouldn’t expect too much for a first gig but don’t underestimate your skills either. Try to find a balance. It’s hard to turn down a job offer but you need to be realistic and know the rates. I wouldn’t hesitate to ask other artists for advice, I am sure they will be happy to help out. What are the dangers that an aspiring artist should be wary of when he is just starting out? I haven’t really had any bad experiences. You need to make sure you have all of your paperwork done before starting though, especially if you’re planning on working remotely. I also see a lot of people putting time and effort into sending their portfolio and CV to various companies. However, I would much rather spend that time working on perfecting my portfolio. Companies are more likely to stumble upon your work and some are bound to get in touch with you. It is so much better than having you force things. This strategy always worked out for me! You upload personal art quite often. Do you think that it’s important for artists do their own thing from time to time? Yes, I think that it is essential for an artist to create something for himself. You need free time to experiment and come up with new techniques that you can use for client work in the foreseeable future. You always need to be productive and reliable when working for a client so there’s no time to experiment but you can start to use processes you’ve developed on your own as soon as you feel confident doing so. The process you undertake should be very straightforward because that’s what you’re being paid for but that doesn’t mean that it can’t be new. Next, doing personal art is a good way of showing people your actual skill level since most artists work on projects that are in development for years so they cannot share their works for quite some time. In overview, drawing and painting for yourself can be very beneficial, but also challenging, or not at all. It’s up to you. It’s a good way to get out of your comfort zone too. That being said, some artists prefer to stay in their comfort zone even when making personal art. Is that the right thing to do? It can be so hard for an artists to get out of their comfort zone. I always tell myself that if worst comes to worst and an artwork turns out bad, I can always just keep it to myself and never show it to anyone. I would’ve learned something anyway. You don’t have to be a perfectionist, keep your expectations low when creating something so that it’s okay if you fail. Any advice you’ve got for people who’re just starting out? I would say that you need to work consistently and observe what’s around you, trying to understand what it is that you are seeing. You ought to learn about perspective so that you can draw a decent representation of space and forms whilst also understanding the structure of what it is that you are trying to represent. It’s important to note that everyone should learn the fundamentals of both drawing and painting. Also, you can look at the best artists in the entertainment industry as well as the old masters. Try and understand why it’s better than your work and learn something from it. Lastly, always question yourself and be honest with yourself about your work. Describe the types of software and processes you use to create artwork. Sometimes I quickly sketch out ideas after familiarizing myself with a brief. I like how immediate and unforgiving the traditional medium can be in comparison to the digital medium, it makes it so you have to consider each and every brush stroke carefully before actually putting it down. After that, I use Photoshop for painting. If what I am making is more complex than what I am used to then I’ll probably start out in 3D-Coat and quickly model before setting up the lighting and textures in KeyShot. © Timothy Rodriguez or their respective copyright holder. Publishing rights for this article have been synchronized with MOMENTA ONLINE.